About a month ago, I took a trip down to Richmond, Virginia, to visit a very special 1957 Mercedes-Benz 300SL Roadster. The car itself is spectacular, but this one also has an incredibly well-documented history that adds to its story. 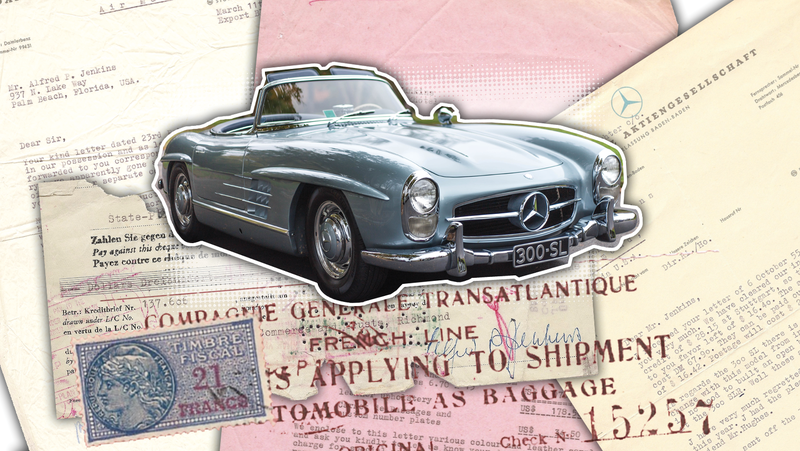 Its owner, Todd Jenkins, inherited the car from his father, Alfred P. Jenkins, along with a whole sheaf of old letters Jenkins Senior had received from Mercedes in the 1950s that led up to the car’s purchase. The Mercedes-Benz 300SL Gullwing first made its appearance at the New York International Auto Show on Feb. 6, 1954. Originally, this was the car that Jenkins Senior had set his heart on after he saw it at the show. But, after being put on a waiting list by the automaker and then spending a bit of time with a friend’s Gullwing, he decided that he wanted the Roadster instead. The letters below from Mercedes trace Jenkins’ pursuit of the Roadster. Using them, you can follow Jenkins Senior’s car-buying decision-making process. What’s funny is that at one point, Mercedes tells him that there’s “no mood” to build an open-top 300SL—and then just a few months later the car suddenly exists. Car companies apparently responded to inquiries 60 years ago about the same way that they do today. Jenkins is still working on finding the letters his father sent to Mercedes, but here are the ones that Mercedes responded with. Finally, on July 21, 1957, Jenkins Senior took delivery of his new car in Germany. He and his then-wife then proceeded to take it on a whirlwind journey around Europe before finally loading the car onto the SS Liberte on Sept. 21, 1957, and headed back to the United States.